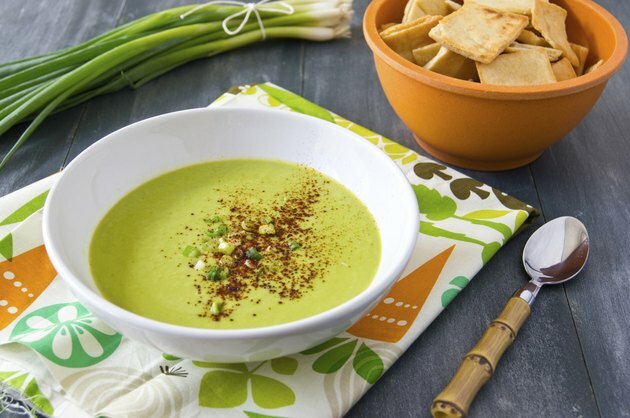 Whether you like to make them a creamy addition to your soup or add them to rice for color and sweetness, you can't go wrong including split peas in your diet. Split peas contain a variety of nutrients and are also protein rich. Plus, these legumes cook a lot quicker than other dried varieties such as kidney beans or chickpeas. When it comes to health and quality of life, calories matter. A 1/2-cup serving of cooked split peas contains 115 calories. If you follow a 2,000-calorie diet, one serving of split peas meets 6 percent of your daily calorie intake, making it a low-calorie option. Most Americans eat more calories than they need, according to the U.S. Department of Agriculture, which is why there is such a high rate of overweight and obesity in the U.S. Including more low-calorie foods in your diet can help you balance your calories and better manage your weight. Split peas are very low in fat and a good source of protein. A 1/2-cup cooked serving contains less than 1 gram of total fat and 8 grams of protein. Most Americans get their protein from poultry, meat and eggs. But the 2010 Dietary Guidelines for Americans recommend that you include other sources of protein in your diet, such as split peas, to vary your nutrient intake and improve your health. Most of the calories in split peas come from its carbohydrate content. There are 21 grams in a 1/2-cup serving. Carbohydrates are essential for health and are your body's preferred source of energy. In fact, most of your calories -- 45 to 65 percent -- should come from carbs. Split peas are also a good source of fiber. A 1/2-cup serving contains 8 grams. Fiber is a type of carbohydrate your body cannot digest. Getting more fiber in your diet helps lower blood cholesterol levels and may reduce your risk of heart disease. Split peas are a nutrient-dense food, which means they contain a large amount of nutrients but are low in calories. Split peas are a good source of vitamins A and B, potassium and magnesium. Vitamin A supports immune health and is necessary for eyesight. The B vitamins assist red blood cell production and also help make energy from the food you eat. You need potassium to build muscle and to break down carbohydrates into energy. Magnesium is also necessary for energy production and to keep your teeth and bones healthy and strong.